Sea Ranch's first residential units, Condominium One, as it looks today. The New York Times has called it 'Utopia by the Sea'—and in many ways the Sea Ranch is just that. "It's the best place to live," says Diane Preece, who's lived in the coastal enclave for seven years. "People come here from Texas, Germany. They bring a happiness with them because this is the place they want to be." Designed by young architects, landscape architects, and designers, mostly from Berkeley and some while teaching at the university, Sea Ranch was something brand new. 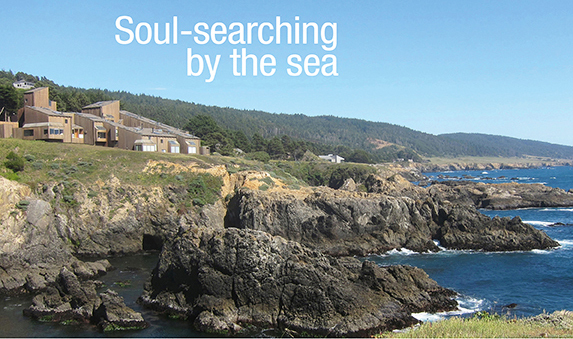 When Sea Ranch debuted in the mid-1960s, it was among the first in a new wave of large-scale vacation communities and provided some of the nation's earliest condominiums. 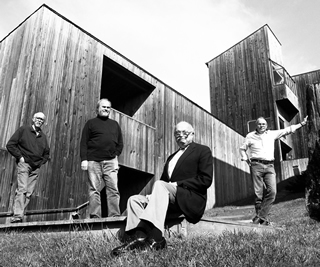 At Condominium One, project architects (L-R) Richard Whitaker, Donlyn Lyndon, Charles Moore, and William Turnbull of the firm MLTW. 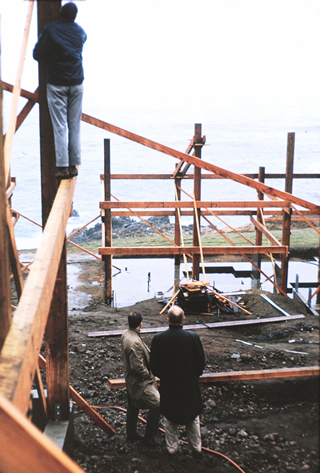 Condominium One under construction in the mid-1960s with its design team looking on. Sea Ranch, an unincorporated community at the far northern end of Sonoma, straddles Highway One, with 1,800 homes for vacationers and full-time residents along the shoreline meadows and in forested hills west of the highway. Owners belong to the governing The Sea Ranch Association, which owns common areas that make up half of the development. Construction of homes began in 1965. Lawrence Halprin, the late Northern California landscape architect who began working on the master plan in the early 1960s, who every year spent three weeks camping in the Sierra with his children, studied Sea Ranch by camping on the land. At times it was so windy he couldn't stand upright "except in the lee of the hedgerows," he wrote. His goal, he wrote, was to create "a feeling of overall place, a feeling of community in which the whole was more important and more dominant than its parts. If we could achieve that, if we could link buildings and nature into an organic whole rather than just a group of pretty houses, then we could feel we had created something worthwhile which did not destroy, but rather enhanced the natural beauty we had been given." Still, for a place that's all about placid, seaside living, Sea Ranch has stirred up its share of rancor, worry, and soul-searching. What, after all, is Sea Ranch? Is it what its creators hoped it would be, a refuge for people who love nature? "Sierra Club types were up here in the very beginning," Whitaker said. "You could buy a lot for $14,000 in the beginning." Or is Sea Ranch in danger of becoming another Carmel, a seaside town that began with modest homes for artists that has filled with multi-million-dollar third homes for billionaires? "Larry wanted smaller lots to sell for less so we would have a diversity of income here," Whitaker said. "It didn't succeed quite all that well, but there are some little places around. In the beginning they were all small—1,000 feet, 1,500 feet, 800 feet. That changed very quickly as the place became more popular."